The AED Plus is more than a defibrillator. 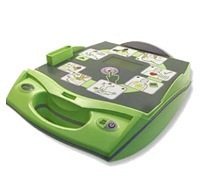 ZOLL has developed a full resuscitation device which not only delivers a shock to a patient when necessary but it also reinforces your CPR training by voice and visual prompts going through all of the steps to CPR. 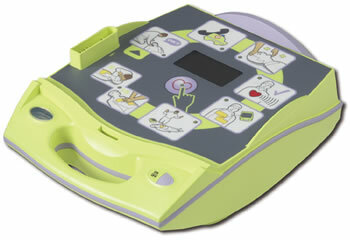 About the size of a laptop computer, an AED typically consist of a main unit that provides controls and instructions, and detachable electrodes that the rescuer puts on the victim's body. 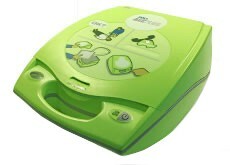 The latest AEDs are remarkably simple to use. They automatically detect what treatment is appropriate for the victim, and give rescuers instructions for administering treatment (usually via audio prompts). AEDs are used in hospitals and by Emergency Medical Services personnel and first responders like policemen and fire fighters. Their simplicity and reliability also allows use by minimally trained laypersons like security guards, health club employees, flight attendants and office managers. Because sudden cardiac arrest is most effectively treated within the first few seconds or minutes of a sudden collapse, AEDs have the potential to save thousands of lives that could be lost if treatment is delayed until ambulances travel to the scene of a cardiac arrest. The American Heart Association's Early Defibrillation movement aims to put AEDs in the hands of all emergency responders and in public places like airports, shopping malls, health clubs, and office buildings. As a result, the potential market for AEDs is very large. The earlier defibrillation is administered, the better. With every passing minute after sudden cardiac arrest occurs, the odds of the victim's survival decrease by 7-10%. The American Heart Association (AHA) estimates that early defibrillation could raise survival rates 30 percent or more. Making it possible for laypersons or first responders on the scene to rapidly administer defibrillation could save thousands of lives every year. The public access defibrillation (PAD) movement, supported by the AHA, would put automated external defibrillators (AEDs) in all emergency vehicles and public places, where first responders or trained laypersons (security guards, flight attendants, office managers, etc.) could use them to quickly treat victims of sudden cardiac arrest. According to the AHA, "PAD...has the potential to be the single greatest advance in the treatment of VF cardiac arrest since the invention of CPR." The latest models of AEDs are remarkably simple to use, automatically detecting which treatment the victim needs, and telling the rescuer exactly what to do. The implementation of early defibrillation programs in the workplace would put automated external defibrillators (AEDs) in locations where trained responders could use them to quickly treat victims of sudden cardiac arrest.